Lawn mowing in North Port, Florida with Miracle Lawn Care, LLC. Miracle Lawn Care, LLC is the company you need when it comes to lawn care in North Port. North Port is a city that requires the best in lawn maintenance which is why our company can be counted on to provide you the best in lawn care and lawn mowing in North Port. Since the North Port area has a unique form and structure the specialization needed for lawn care in North Port calls for experts who know their grasses from their weeds. We provide the most comprehensive lawn care service that other companies envy. Your neighbors will tell you that our lawn mowing service is the best one out there. That’s because we care. We want to please you, and we want you to call us back year after year. And we want you to spread the word to your friends and neighbors. Also, our North Port mowing services are the best because we know how to make a lawn look good. We are meticulous when it comes to mowing and trimming. And we make sure that we don’t leave any debris behind. Also, our mulching mowers finely chop the grass clippings and redeposit them in the soil. This adds nutrients to your lawn and helps it retain moisture. This is especially important during the hot months of June, July, and August. We waste nothing and take care of your lawn as if it were our own. 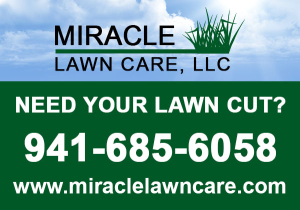 Call now and get a free estimation at 941-685-6058 or send an e-mail to info@miraclelawncare.com.